Pictured, from left to right: Provost Emeritus Jacob Nyenhuis, President James Bultman, Honoree Jan Peter Balkenende and Provost Richard Ray. 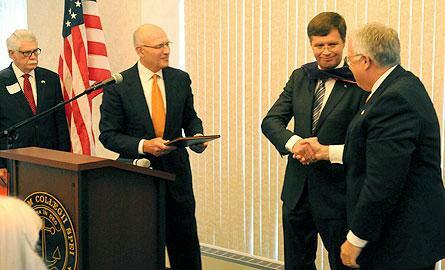 Dr. Jan Peter Balkenende, former prime minister of the Netherlands, received an honorary Doctor of Laws degree from Hope College on Friday, Sept. 7. Dr. Balkenende also presented a public lecture, “Europe: Risk or Opportunity? Economic developments, financial challenges and European values”. He was honored in recognition of his distinguished service to the Kingdom of the Netherlands and for his emphasis on Christian principles as a component of good government. Balkenende was prime minister and minister of general affairs of the Kingdom of the Netherlands from July 2002 until October 2010. He is now a professor of governance, institutions and internationalization at the Erasmus School of Economics and the Erasmus School of Law of the Erasmus University Rotterdam. He is also a partner at Ernst & Young (BeNe Head Office, Rotterdam), responsible for international affairs, corporate responsibility and advisory activities on public-private issues. Balkenende was born in Kapelle on May 7, 1956. After completing his secondary education, he went on to the Free University of Amsterdam where he studied history, graduating with an M.A. in 1980, and Dutch law, graduating with an LL.M. in 1982. He obtained his doctorate in law in 1992 with a thesis on government regulation and civil-society organizations. From 1982 to 1984 he was a legal affairs policy officer at the Netherlands Universities Council, the umbrella organization for Dutch universities. He then served on the staff of the policy institute of the Christian Democratic Alliance (CDA) until 1998. As a senior staff member, he was responsible for social, economic and financial affairs, including development cooperation, technological innovation and European integration. Balkenende was a member of Amstelveen municipal council from 1982 to 1998, and leader of its CDA group from 1994. From 1993 to 2002 he was a part-time professor of Christian social thought on society and economics at the Free University of Amsterdam. From 1998 to 2002 he was a member of the House of Representatives of the States General for the CDA. He led the CDA parliamentary party from 2001 to 2010. His tenure as prime minister saw reforms in fields including social security, pre-pension facilities, public health and deregulation. He also played an active international role, in Europe, including as president of the European Council in the second half of 2004; in the G20; and in the United Nations, with a special emphasis on issues like sustainable development, Millennium Development Goals and the World Trade Organization. He paid many official visits to other countries, often accompanied by trade mission representing Dutch companies. Across his career he has also been a member and vice-chair of the board of the broadcasting organization NCRV; a member of the Amsterdam Regional Forum; chair of the Association of Christian Lawyers; a member of the group on socially responsible business practice in the Royal Association MKB-Nederland, which represents employers in small and medium-size businesses; and a member of the board of the Parliamentary History Group. Balkenende has written many books and articles, including “Government Regulation and Civil Society Organizations” (1992), “On Responsibility and Economics: What Next?” (1993), “Responsibility and Law” (1995), “Trust and the Economy” (1997), “Different and Better” (2002), “Private Enterprise and Society” (2003), “Shaping Europe’s Future” (2004) and “Prime Minister, The Floor Is Yours” (2010). He is the author of many policy documents on economic growth, social security, fiscal policy, poverty, development cooperation and innovation. He has received four other honorary doctorates: in theology, from Karoly Gaspar Reformed University in Budapest, Hungary; in systems design and management, from Keio University in Tokyo, Japan; in sociology, from Yonsei University in Seoul, South Korea; and in humane letters, from Hofstra University in Hempstead, N.Y. His other honors include eight Grand Crosses, including Knight Grand Cross in the Dutch Order of Orange-Nassau, and several international prizes. Balkenende is married to Dr Bianca Hoogendijk, a specialist in labour law. They have one daughter, Amelie. The teacher-education program at Hope College has earned a 70, the highest score possible, on the Michigan Department of Education Teacher Preparation Institution Performance Scores Report released this summer. The Hope College chapter of the national Mortar Board honor society has continued its tradition of recognized excellence, again receiving multiple awards during the national organization’s annual summer conference.